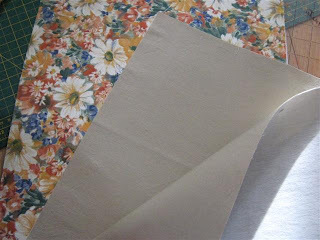 There's more fabric in the house than food. Your ironing board is always set up, but you never iron clothes. You think of your job as an interruption on your quilting time. You can measure a scant 1/4 by eye. Your "UFOs" are not from outer space. Featherweight - nope, my machine isn't one, at least it weighs a ton, and I'm not familiar with "Featherweights"
sewing room clean-up - nope, I don't clean it up, which kind of makes it double-check, no? I give myself half-marks. 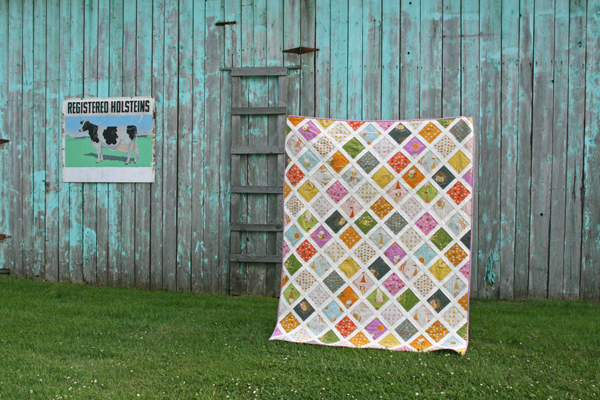 Haha, I thought there was a deadline for this mystery quilt that my quilt guild arranged. So I crammed and crammed to get this thing done by last Wednesday, and it turns out there's no deadline. But it's finished, and that's great! Just like the mantra we had at the guild that evening: Better finished than perfect! 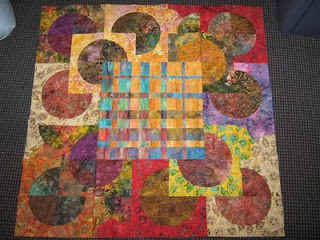 Below are a bunch of pictures showing the quilting. 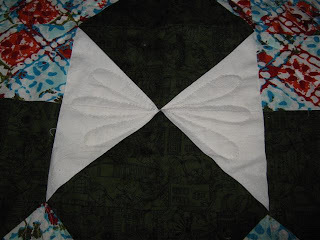 After trying to figure out how to quilt a quilt that's so puffy in places from those unsquared blocks, I decided minimal quilting targeted to safe, non-puffy areas was the way to go. 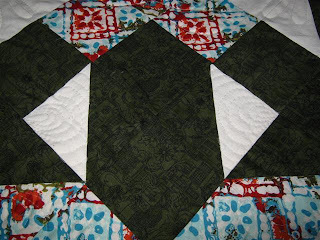 Because there was nothing to lose on this quilt, I also decided to play around with new quilting motives. I hate practicing free-motion and wasting good fabric on those pieces, so I use quilts that are already less than perfect (*grins*) and make them into guinea pigs. I tried feathers in the center, but got tired of those. 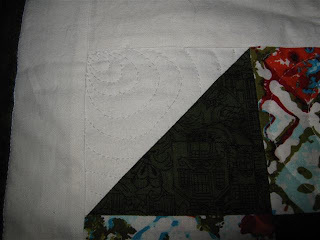 Then I tried blossomy-loops in the white hour glass shapes, those were okay. What ended up giving this quilt its name, Mussel Mystery, was the mussel-shell like McTavishing I started and kept going with in all the white triangles and some of the multi-coloured ones. 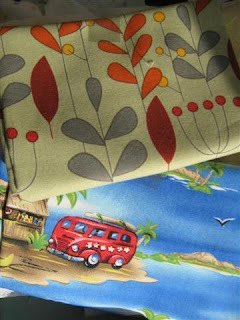 I'm trying really really hard not to buy fabric. I need to use up some first. 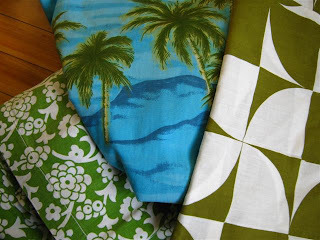 The top one will become a purse most likely, the bottom one I want to make into a lap quilt for work - wouldn't you love to dream of vacation on an island while typing away on the computer in the office? 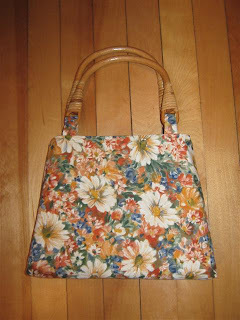 Anyway, I checked in the second hand stores to see if I could find a cheap purse with handles I like - nothing. But I found these sheets and pillow cases that'll come in handy as quilt backings and placemats (a project from my quilt guild for the local soup kitchen.). 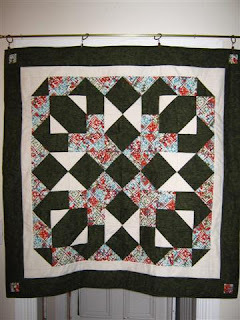 I don't know how, but I totally missed that it was National Quilt Day on Saturday - is it a US thing only? I figured: T'is the season for pulling out year-old projects! 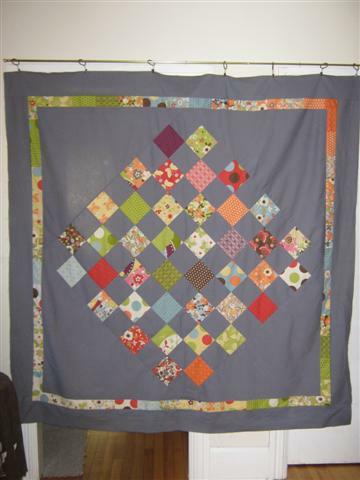 Like my spring quilt from 2009! Between this one and my "Apples and Owls" fall quilt, a kind of pattern is emerging: Make a seasonal top, then let it rest for a year and finish it the same season a year later! 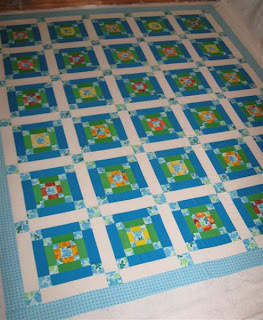 In that spirit, I've finally jumped in the cold water and put a border on this quilt - that's really what the hold-up was: the border. 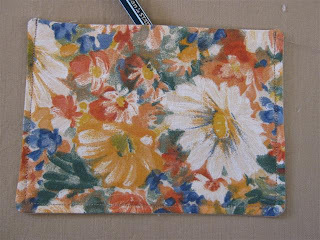 You may have noticed that I generally use fabrics from the quilt center in the borders. 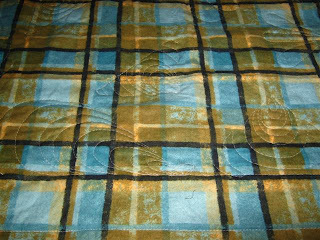 I've seen many quilts with totally different fabrics in the borders, but never had the guts to try that. 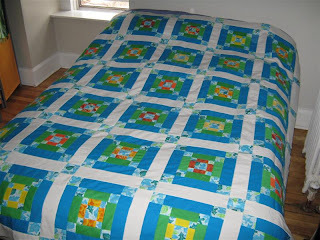 Pick the wrong pattern/colour and the whole work of the quilt center is ruined. But this time, I reached that point of thinking "just do SOMETHING"! 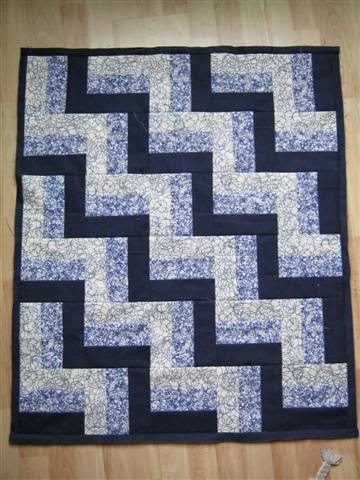 So I found some fabric that matches the light blue in one of the theme fabrics (the bluish leaves in the diagonal lines) and threw that on as border. 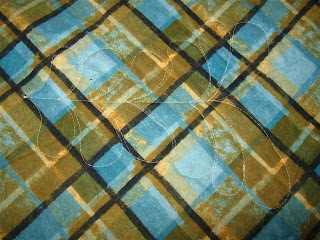 You can see the pattern of the border print in the bottom of this photo: dark blue squares on light blue background. I was worried it'd be too busy with the rest of the quilt, but I think it will do - too late now, anyway :) I'm not taking it off again! 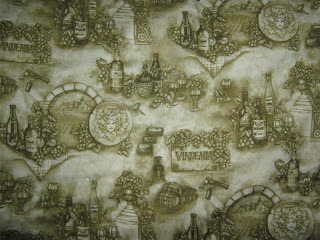 I chose a green print for the backing - it made me think of spring even though it depicts wine and grapes, i.e. more fall-ish. 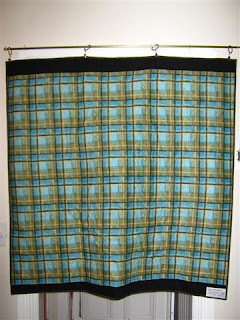 I bought this fabric when it was on sale for 2$/m, what a steal (that's $ Can!). 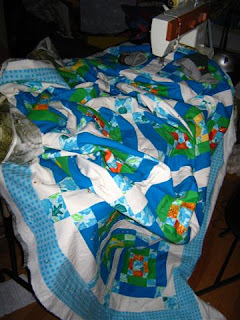 See now, I always think it's outrageous how much fabric I bought in my first quilting year - meters and meters of fabric at once - but you make up a backing for a large quilt and woosh, 5 m are gone, just like that! (Imagine sound of snipping fingers). 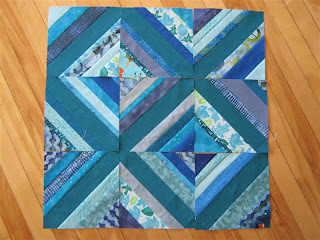 I'm playing with some quilting ideas for this one, but I'm starting to believe that it'll actually be done in time for this year's spring (which has not arrived in Prince Edward Island! I'm so jealous of the budding flowers I see on blogs from down south!). 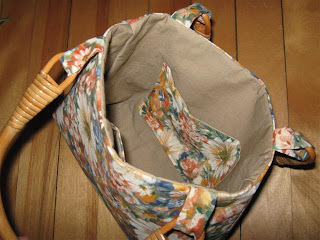 I followed a basic fat quarter purse tutorial and built in some of my own modifications. 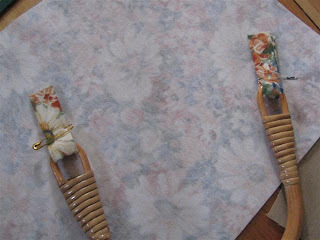 I started by cutting a 2" x 20" strip of my print fabric (the width of the strip depends on the holes in your handles, as these are the handle attachments). 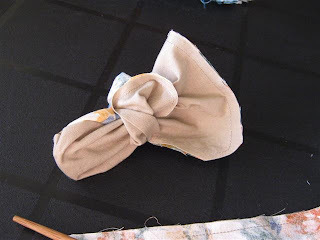 Fold it in half lengthwise, right sides facing and sew along the long edge with 1/4" seam. 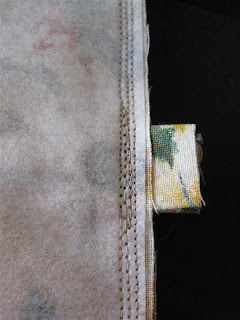 I sewed this red ribbon to the starting end and had it inside the folded crease while sewing along the edge - this will help with the turning inside-out of the tube. 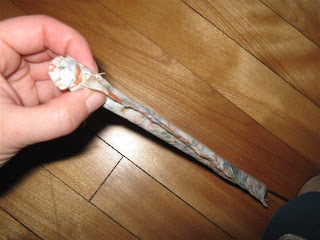 To turn the tube inside out, pull on the ribbon and tug and tease till the tube gets moving. The start is finicky, after that: smooth cruising. 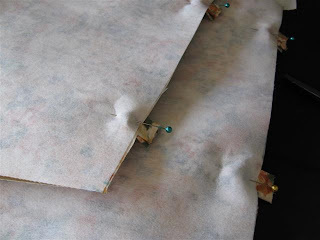 Press the tube with the seam in the middle (see the piece on the left below), then cut the tube strip in half, and both halves in half again. Mine came out to just under 5" each. 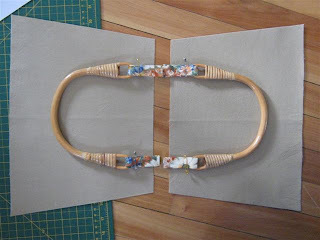 Pull each strip through a loop in your handle, match the ends up and secure them in place with a safety pin. 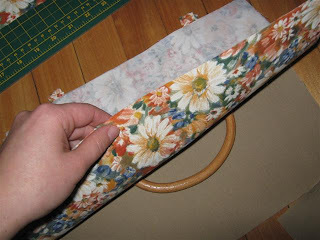 Switch to the purse body: instead of cutting a fat quarter in half, I cut a two pieces of print and lining fabric approximately the size of the purse I wanted to get. 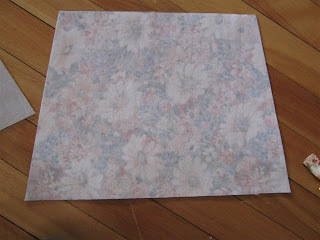 You should have 4 identical pieces: two of the print and two of the lining. 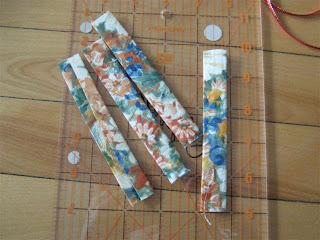 Cut matching pieces (4 in total) of fusible interfacing. Iron the interfacing to the wrong side of each fabric piece (my interfacing didn't stick very well - it was my first time working with the stuff, so I don't know if that's normal or not). 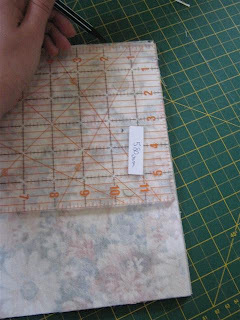 I didn't want a rectangular shape, so I marked 1.5" (the photo shows 1.75", but that looked to steep, so I changed it to 1.5") from the edge of the top side of my print and lining fabrics and cut a wedge off each side. 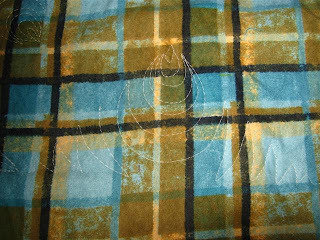 I cut all my layers at once, to make them identical. 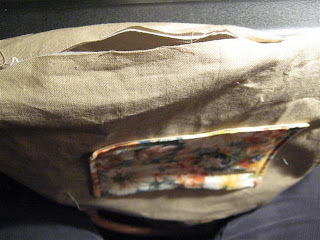 Lay the lining pieces face up and center the purse handles on top as shown below. 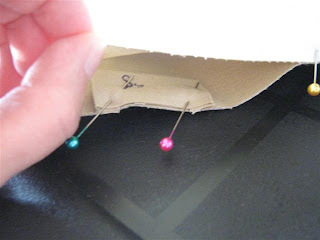 Decide how far you want to have your purse handles protrude from the purse, taking into account your seam allowance (I used 1/4" for everything). 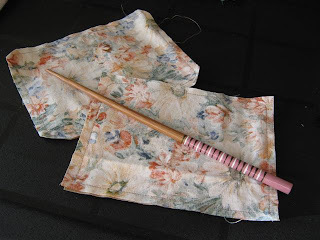 I left about 1.5" from the wooden handle to my seam allowance. 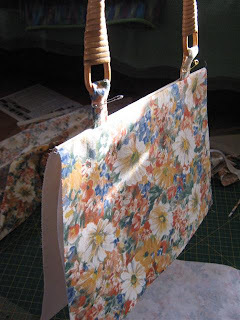 Place the print fabric on top of the lining and handle so that right sides are facing (interfacing on the outside). 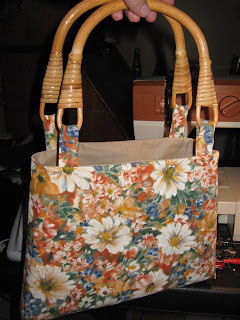 Pin the handle straps in place and check that both halves of the purse have the handles positioned equally. 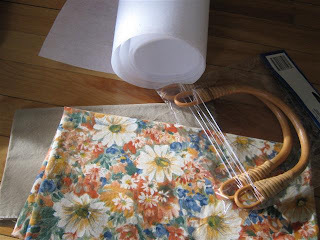 Sew along the top edge (i.e. 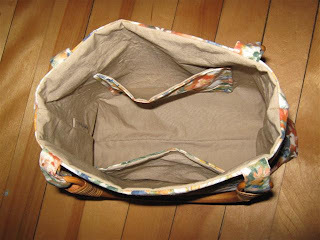 the edge where your handles are attached) of each purse half only. Sew over that edge again, about 1/8" closer to the fabric edge, and go over each handle strap back and forth twice to strengthen this seam. 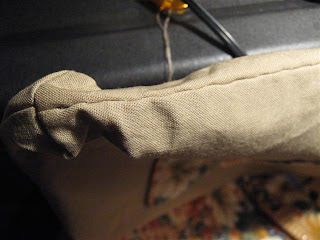 Trim off the excess handle strap protruding past the seam. It's starting to resemble a purse! I decided that I wanted inside pockets. 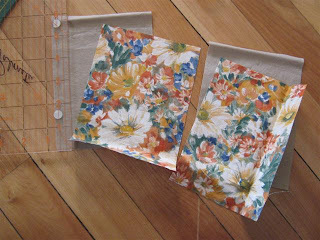 Cut identical pieces of lining and print fabric (1 each) per pocket in the size you want your pocket to be. 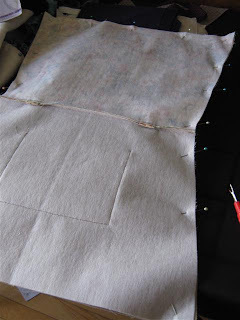 I wanted my pockets to stand out, but if you want them more subtle, use lining fabric only. My pieces are about 6"x4". 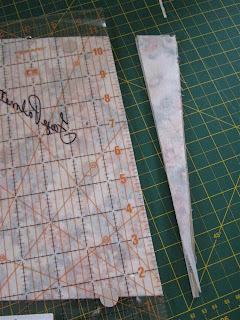 Put the lining and print fabric pieces together right sides facing and sew 1/4" seam all around, leave a 1.5" opening. I rounded the bottom corners of my pocket, personal preference). 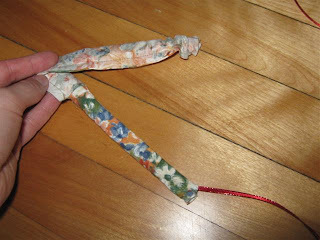 Turn the pouch inside out and use chopsticks or something similar to gently push the corner out. 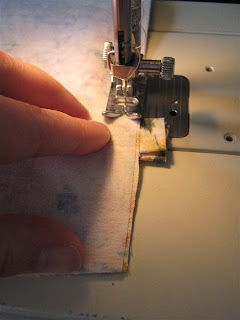 Press the pockets so that the opening has the fabric folded in 1/4" - you don't have to hand-sew this shut, it'll be done by machine in the next step. 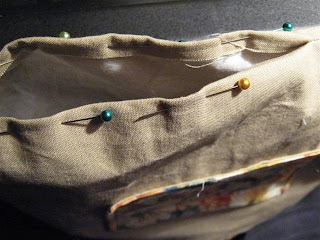 Place the pocket on the lining of your purse, you can pin it in place. 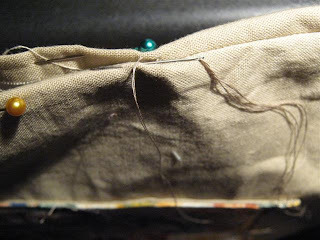 Sew along the edge, about 1/8" seam, all around the pocket, and enforce the start end end of the seam by sewing back and forth a few times. 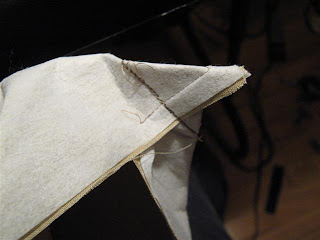 Pin all around making sure that the corners and the middle seam (where lining switches to print) match up. 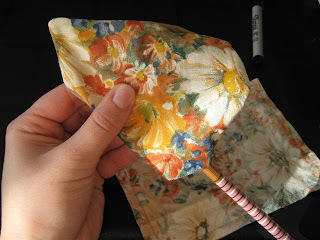 Sew a 1/4" seam around the whole sandwich, but leave most of the lining bottom open so that you can fit your handles through when you turn the purse! 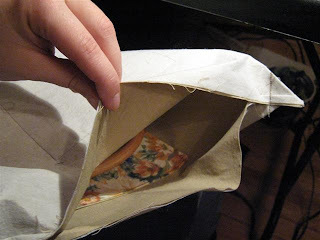 For a flat bottom, pinch all 4 corners of the purse sandwich and sew across the flap. 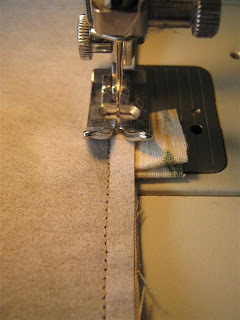 The longer your seam, the wider your bottom. 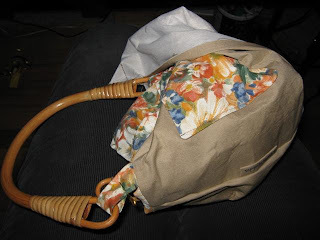 Your purse will stand up this way and have a bit more storage space for bulky items. Snip the excess tips off. Now the really awkward part of turning the whole think inside out through the opening. After the turning inside out step, I managed to sew the opening shut for another 2" or 3" before I didn't have enough space to maneuver under the machine. 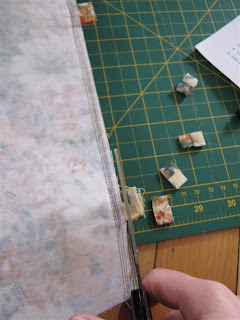 I pinned a 1/4" fold to make the hand-sewing easier. 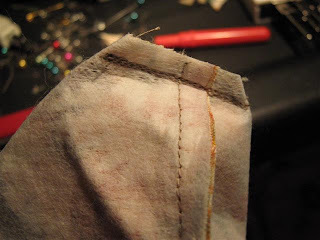 Use the invisible ladder stitch or a similar type of hidden stitching to close the gap. I'm really proud of my first-time purse accomplishment! I love how the label worked out, you can see it on the left, very subtle. 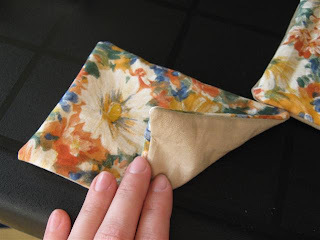 I love the pockets so I don't have to rummage for keys or a handkerchief. 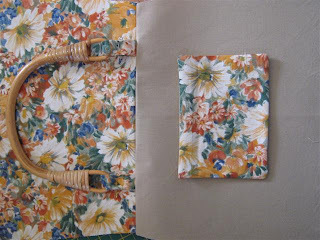 And I love that it's mine, with one of my favourite fabrics - this one always makes me think of summer and I've had it since I spotted it in a store at the age of 12 or so (way before my quilting days!). 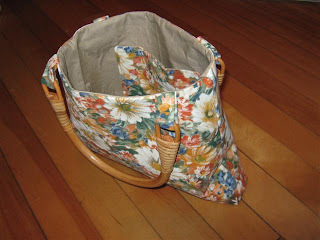 I have a bunch of friends lined up to receive purses - my only problem are the handles - I'm having really bad luck finding nice ones like those sold at Joann's (black and sleek). I'll start searching the 2nd hand stores for old purses, and I might have a chance to visit Joann's in April, that'll be exciting! 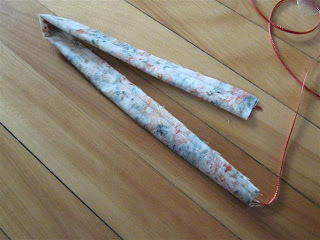 So, do you feel like making one? This one took me an hour and a half from start to finish, so you have lots of time before summer!